Since 1986, the Koons brothers have sold millions of dollars’ worth of real estate including farms, homes and commercial properties. 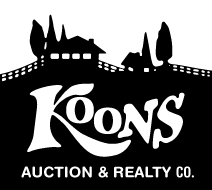 Whether it’s an estate sale of antiques and personal items, or an auction of farm machinery - Koons brings the buyers! The Koons facility on Route 44 offers 9,000 sq. ft of auction space and more than 10 acres of off-road parking. Or the sale can be held on your premises, using the Koons mobile office. Bidder registrations and financial transactions take place in the trailer, and outdoor auctions are run from our elevated “auction topper” on the pickup truck for better visibility. Check this page often, to keep track of our upcoming sales!